I think that it was back in 2005 that I attended a performance at the Bridgewater Hall, Manchester, of Rachmaninov’s The Bells, given by the Hallé under Mark Elder. I was mightily impressed by the sheer sonic impact of the performance as well as the music, and resolved to keep an eye open for more performances of choral works there. Subsequently I have been to Sir Mark’s performances of Elgar’s mighty oratorios, The Apostles and The Kingdom. Each was an event of musical significance, because both are masterworks, both are rarely performed and Elder had gone to great lengths to present these works as Elgar intended them to be performed. I can remember suppressing tears at the conclusion of The Apostles, so great was its musical and physical impact, and for those members of the audience who were Christians, doubtless its religious impact was also great. That performance is available of a Halle two CD Set CD HLD 7534 and The Kingdom on Halle CD HLD 7526. Unfortunately, I did not manage to attend the Hallé/Elder performance of Elgar’s last great choral work, The Spirit of England, composed between 1915 and 1917, and so I am pleased that it is presented here in this Hallé CD, coupled with A Voice in the Wilderness (1915), the Incidental Music to Grania and Diarmid (1901) and Arnold Bax’s In Memoriam (1916). 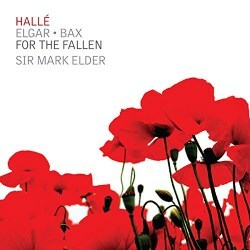 The CD itself is titled For The Fallen, and that phrase accurately reflects its content. I hope that there are very few MusicWeb readers who still consider Edward Elgar to be a composer of jingoistic Victorian and Edwardian imperialist music, irrelevant to today’s environment. Like most people, Elgar responded to the mood of the time, which was imperial and so there are pieces in his output that more or less fit that description, but they are few and he did not originally set the ‘Land of Hope and Glory’ words to his first Pomp and Circumstance March – they were fitted after King Edward VII suggested to Elgar that the tune in its trio would make ‘a great song’. Elgar subsequently set the tune and words into his ‘Coronation Ode’. Having got that off my chest I can say at the outset that these are all excellent performances, well recorded, and where live – The Spirit of England, A Voice in the Wilderness and In Memoriam - audience noise is non-existent. The major work here is The Spirit of England, and lest its title put people off, I should explain that it is a work composed as a sorrowing tribute to a people and their defenders who had suffered mightily in the preceding four years. Elgar himself was torn between his natural regard for his native land and his regard for German musicians and audiences who had performed and listened to his music before those of his own country did. He struggled desperately with one part of the poem where the word ‘vampire’ is used to describe Germans and only managed it by quoting from ‘Gerontius’. The excellent and greatly detailed booklet that accompanies the CD describes Elgar’s difficulties, and it must be remembered that at the time, just after the war, many people in Britain regarded Germans as being hellish demons. Such ideas are anathema today, but they were not in 1915. The work is in three parts, all settings of poems by Laurence Binyon, and the first part ‘The Fourth of August’ is the section that gave Elgar the trouble, but in it he establishes the principal theme of the work, a sombre rising and falling sequence. Compassion and dignity are the keynotes throughout, with the soprano soloist taking a leading role. On listening, it rapidly becomes clear that Elgar was inspired by his subject despite his difficulty. Indeed the whole work was dedicated ‘to the memory of our glorious men, with a special thought for the Worcesters’. The performance of this movement is very fine, with firm, clear choral tone and the usual great playing by the Hallé. The soprano, Rachel Nicholls has a pleasant voice, which she uses intelligently but with a little more vibrato than I consider ideal. I prefer Teresa Cahill in the 1976 Chandos recording, (CHAN Collect 6574), who sings with a slightly deeper voice and steadier vocal production. In the second movement ‘To Women’, Binyon likens England to a woman mourning for her children, but there is an individual note to it, where the verse remembers the ‘boundless night of fears’ that so many women suffered and had their worst fears confirmed. Elgar sets the words to music of deep, deep sadness with an almost impressionistic tone. All involved are splendid here. The last movement, entitled ‘For the Fallen’ is the heart of the work, and is as long as the first two put together. It contains the famous words: “They shall grow not old, as we that are left grow old: / Age shall not weary them, nor the years condemn. / At the going down of the sun and in the morning / We will remember them”. Elgar is marvellous here; if he was firing on four cylinders in the two previous movements, then here he is firing on six. A gigantic, slow funeral march constitutes most of the movement with the orchestra, chorus and soloist employed with vigour alternating with hushed mourning. He used his own experience in at least one place in the movement, where the text reads ‘They went with songs to the battle’, Elgar explained (in a letter to Ernest Newman) that the music at that point was “a sort of idealised (perhaps) Quick March, the sort of things which ran in my mind when the dear lads were swinging past so many, many times”. In fact, this section is quite hushed. The word setting is amazing and the magnificent climax at “As the stars are known to the night” the soprano, Rachel Nicholls, soars superbly as the chorus and orchestra blazingly intone the dreadful march. Surely as inspired a piece of music as Elgar ever composed. Soon after this, the work ends pianissimo to the words: “As the stars that are starry in the time of our darkness / To the end, to the end, they remain”. The recording is very well balanced throughout, with no audience noise and one is left with the impression of a performance given with power, yet reverence as well hope for the future. The next work on this well filled CD is an occasional piece A Voice in the Wilderness (Une Voix dans le Désert) and is rarely performed these days, probably because it is a melodrama. The actions of the German army in Belgium were vividly reported in the British Press and invoked outrage and sympathy, so Elgar composed this piece and the earlier Carillon, both with spoken words by the same Belgian poet, Émile Cammaerts. Both were a great success. A stage with a simple setting representing a small cottage near the Western Front, and a speaker intones words by the poet. Subdued music hovers in and out of his speech, as he comments on the splendid courage of a girl near the front line. The music warms and the soprano sings “When the Spring comes round again”. As the voice soars, Elgar’s inspiration takes off. The soprano, Jennifer France is excellent, and if you want to hear this work you could do no better than this recording. Incidentally, the speaker, Joshua Ellicott, was born in Manchester and his voice rings clear. The third work consists of the incidental music to Grania and Diarmid and the song “There are Seven that Pull the Thread”, beautifully sung by mezzo-soprano Madeleine Shaw. The music lasts about 12 minutes and was compose by Elgar to support a play that came about as collaboration between W.B.Yeats and George Moore (an Anglo-Irish novelist). By far the most impressive section is the central funeral march for Diarmid. Elgar himself described it as “big and weird” and perhaps “suitable for commemorations”. Well, I don’t know about weird, but it is certainly instantly recognisable as Elgar in inspired mood, and has been recorded several times, and this one is as good as any. The sound quality is subtly different - perhaps a bit more reverberant - from the preceding pieces, probably because it was recorded in the Hallé’s new rehearsal centre in Ancoats. I hasten to add that by different I do not mean worse, all the recordings on this excellent disc are very fine. The disc finishes with a fine performance of Bax’s In Memoriam. He was fervent in his support for Irish independence, and the piece was originally entitled ‘An Irish Elegy’ following the uprising in Ireland in 1916. Some of its leaders were subsequently executed for treason, including Padraig Pearse. In his authoritative biography of the composer, Lewis Foreman differentiates between two works – ‘In Memoriam (An Irish Elegy)’ and ‘In Memoriam (Padraig Pearse)’. The first was composed as a sextet and the second as an orchestral work, both dating from the same year. I have listened to this recording and the Chandos recording, explicitly stated to be of the Pearse piece, made by Vernon Handley and the BBC Philharmonic in 1999 and a gorgeous work it is. An oboe with harp accompaniment begins the piece and this soon gives way to a lovely, long, flowing melody on the strings with harp and orchestral underpinnings. It carries on to a big climax and the big tune reappears with varying orchestration. I cannot understand why this immediately appealing work is not more often performed. Both are fully committed performances of a typically Baxian orchestral score; the Hallé recording is a tad clearer, more focussed, whereas the Chandos, in typical house style is more lush. So, to conclude: If you are looking for a recording of The Spirit of England I would recommend Sir Alexander Gibson’s Chandos CD from 1977, coupled with the Coronation Ode, and this is primarily because I prefer soprano Teresa Cahill’s singing – she is balanced slightly further forward in the (studio) recording and sings with rather less vibrato than the otherwise excellent Rachel Nicholls. This statement reflects my own dislike of vocal vibrato. On the other hand, if you want a beautifully recorded and performed CD that contains some rare Bax and Elgar works, all fitting the disk’s title of In Memoriam, then go ahead and buy this disk – you will not be disappointed.